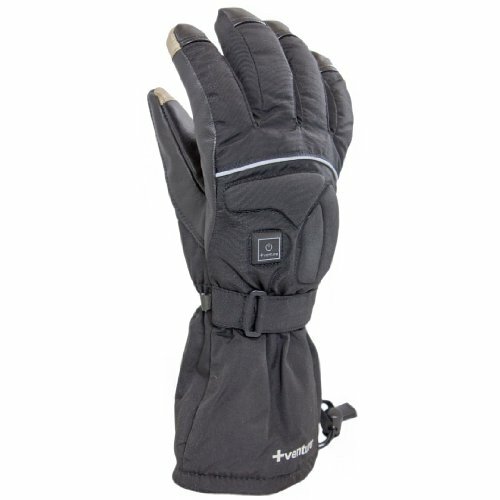 Venture heated gloves are known to be some of the best in the industry. Whether you need to keep your hands warm out of necessity or just for some extra comfort, you’ll be happy with your decision to choose Venture. Today I’m going to review the Epic 2.0 model. The Venture Epic 2.0 heated gloves are one of my favorite pairs on the market. I really like these gloves and they’re the ones I use the majority of the time. These are unisex so they’re available in a lot of different sizes but they do fit a little bit small so if you’re somewhat between sizes you should definitely spring for the bigger size. As always, our Sizing Guide will come in handy. I know these are more expensive than most pairs and that alone might be enough to scare some people off but please don’t let that deter you. I assure you that you won’t regret spending the extra money on these. And for the people who always want to have the best available, top of the line product no matter what, this is the glove for you. I find these gloves extremely comfortable. The exterior is made out of nylon but it has a leather palm for extra comfort and grip. The interior of the glove is made of 100% polyester which is also great for warmth and comfort. Between the polyester interior and the nylon exterior there’s a nice layer of 3M insulation for added warmth. It is relatively thick which makes them extremely warm but it does however limit the dexterity somewhat. If you’re looking for a really warm glove this would be a great option. Between the polyester interior and the 3M insulation there’s a Dintex membrane which makes these gloves totally waterproof and breathable. There’s a good size gauntlet which will fit over pretty much any jacket sleeve to keep out that cold air and moisture. There are 3 heat settings, low, med and high. I found that the high was really warm and probably even the warmest heat I’ve ever felt come from a pair of battery powered gloves. The low is a nice level for maintaning warmth and the medium is the sweet spot that I find myself using a lot on the really cold days. The overall comfort is perfect. Sure they’re a little bulky but I expect that from an extremely warm glove. I found them to fell great on my hands and I never got tired of wearing them. In the warmth category I’m giving them a 20/20. In the comfort category I’m giving them a 18/20. As I mentioned before they have the Dintex membrane which makes these gloves totally waterproof. I’ve worn these gloves a lot and I can’t really add anything other than the fact that these will keep your hands dry guaranteed. As you can see they pass the water test with flying colors. I have no reason to dock them any points in this category so I’ll be giving them a score of 20/20. Upon initial inspection I thought these gloves looked really durable. The stitching is strong and the fabrics hold together very well. I checked the wiring and the power button and they seem good too. Just the fact that you can submerge them under water and the power button isn’t fazed is a great example of the quality. Now I haven’t personally had any problems with them but I have read some online reviews from other people stating that they had some issues. Some people had problems with the wire connections coming apart at the connections. A few people said that their gloves started to come apart at the seams after some use. Now this is for sure possible that both of these things could happen but we always have to be careful when reading about problems like these ones. The reason we have to take them with a grain of salt is because we don’t know how these people had been using the gloves. It’s possible that they were getting really heavy use and possibly abusing them. Just like any possesion, it’s important to care for your heated gloves in order to keep them in good working order. I know one complaint came from a ski instructor who is teaching kids to ski. Now this is a problem because in that job you’ll be constantly picking up skiis and handling them to help the kids. The sharp edges of skiis are really hard on any gloves and for that application you should seek out more of a work glove. These gloves aren’t meant for a heavy work load because they just haven’t been equiped with extra padding in the palm area. If they were, they would lose out a little bit in the comfort category. With all of that being said, I’m giving them a 17/20 for quality. These gloves come equiped with two 7V 1800 mAh batteries. This is a rechargeable Lithium-ion battery and when cared for properly it should perform very well. It’s very similar to the battery you’ll find in most smart phones. The people at Venture aren’t going into huge detail in regards to how long the battery will last. They’re a little vague about it and they just say that you’ll get 5+ hours of heat. From my experience you’ll only get 5+ hours out of them if you’re either using the low setting or you’re only turning the high heat on periodically to warm up. So that’s not too bad considering how hot these things actually get. As I said before, I didn’t need the high heat all the time. I found myself using the medium setting the most but there are other techniques you can use to preserve the battery even better. I like to start the day with them on high just because that’s usually when I get cold. After my hands are nice and toasty I shut them off completely. 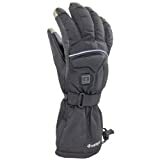 Since these gloves have good insulation they hold the heat quite well and you can have them off for extended periods of time depending on the temperature outside. Then just switch them on anytime your fingers start to feel cold again. This works fine for me but if you need more warmth just swith between Low and High instead. Additionally you can also buy a second set of batteries if your really want to have lots of heat time. There are the odd negative review online saying that the battery dies after one season or 1 year or whatever. This shouldn’t happen and Venture should send you a new battery if it does happen. However, you also need to take good care of the battery to help it last longer using these techniques…. All in all I was pretty happy with the battery and so I’m giving it a 17/20. Like I said before these gloves do fit a little small. If you’re between sizes you’d be better off going for the bigger size. As usual you should see our Sizing Guide and make sure you take your measurements before ordering them. I have to say that I love these gloves. They are still my go-to gloves for any winter/cold weather activity. As you can see I rated them very high in all categories and I haven’t had any problems with them as of yet. I have to mention the fact that they also have touchscreen capability. Both the index finger and the thumb are equiped with the special material that allows them to work with your smart phone or tablet. I love this feature because there’s nothing worse than having to take off your gloves at any point during the day. Not only does your hand get cold but it also can be tricky getting all of your layers set up in a comfortable way and once they are, you don’t want to mess with it. Out of all the gloves I’ve reviewed I have to say that this one is at the very top. You really can’t go wrong with it and I know you won’t regret spending the extra money. Thanks for stopping by today and please leave me your comments or questions in the box below. I always respond ASAP. Heated gloves are a great item in the winter time especially if you have to spend any extended amount of time outdoors. It’s great that these gloves are waterproof. Too many times gloves will keep your hands warm but as soon as they get wet, your hands are frozen. That is a nice feature. It seems like you get a decent amount of hours out of the battery which is always key. Great review! Ya there’s nothing worse than have soggy wet hands and gloves. The other thing I forgot to mention in the review is that not only do these gloves keep your hands dry but they also don’t absorb any water. This is pretty important because when the gloves start to absorb water they get really heavy and uncomfortable. Anyways, thanks again for the comment. These are amazing. My husband is off on a skiing trip soon and he has quite large hands, so these will be amazing for him! I didn’t know you could get such a thing. And in different sizes. In fact he is terrible in the cold, I don’t really know why he’s going! Thanks for the info. Thanks for the nice words. Well if your husband ever complains about cold hands again you know where to look. Hopefully there’s something here that will fit him. Most of them come in pretty big sizes so it should t be a problem. XL is very big but just have a look at our sizing guide if you aren’t sure. Great review, Robert. I must say that I learned something new about gloves. I never knew that there were battery equipped gloves. How cool is that? This Venture Epic 2.0 glove seems to be an all round great glove. I like your video as well which shows that it is water resistant. What makes this better than its nearest competitor? Thanks for a great review. Thanks very much and I’m really glad you liked this review. Well all our reviews are scored using a point system out of 100 points and broken down into 5 categories that are each scored out of 20. So you should be able to see where this pair pf gloves scored the highest and where it lost points. But to answer your question directly I think this glove did really well in the water resistance category which might separate it from some of it’s competitors. I read your review of the Venture Epic 2.0 gloves and found your review to be very informative. These gloves would of been good for me when I had my Harley Davidson motorcyle. I live in California where it gets cold but not cold enough for these type of gloves. As a matter of fact, I don’t ever wear gloves, but if I did, I would easily be persuaded to buy a pair of the gloves your are marketing. Thanks a lot for the comment. I’m glad you enjoyed this review and that you can see the value in this product. Hello Robert, I see that you say these are comfortable and that they have the leather I was wondering if these will last in the workplace? I work outside and I’m curious if these will last working in. I’m looking for a good pair of gloves to keep my hands warm during the work day and if these will hold up they look to be what I’ve been looking for. Thanks a lot for the question. This is a really good question and the short answer to that is no. I would not recommend using this pair as work gloves. They aren’t designed to hold up to heavy lifting, sharp objects and industrial tools. My recommendation for heated work gloves would be to get a pair of thin liners that you can wear under your regular work gloves. A good option is the Venture Heat City Liners. That way you can get the heat and the protection all at the same time. Hope that heps. P.S. If you’re in Canada, that Venture Heat City link won’t work for you. Try this link for Canada. Hello, Great site with great content. I am a freeze baby,lol! I can’t stand the cold. Those gloves you have look amazing. I know what your saying about those hand warmers that you stick in your gloves and they don’t work well at all! Minnesota gets brutal in the winter but its been pretty mild and I bet where you are it really gets cold. So do you think you may consider something with boots and jackets? Keep up the great work! Yes there are quite a few boots and jackets that heat up as well. There are also pants. It’s a growing industry and the gear is really high quality nowadays. I like the gloves the most because that’s usually the first thing to get cold but I’ll be reviewing some other heated gear soon enough so keep an eye out for it. Those gloves look really warm! How warm are they without using the battery? I’ve never even heard of heated gloves until I read this page. It’s unique. I know I’ve been out shoveling snow and freezing my hands off, so this is definitely worth looking into. 5 hours on battery isn’t bad at all. Cool stuff. These particular ones are still really warm without the heat option. I actually think the best way to use them is just wear them like regular gloves as long as you can. But if your hands ever start to feel cold just turn on the heat and you’ll be toasty warm in no time. I love using them this way because then they last for a really long time. Thanks for the comment. This is an amazing idea. I wish I would’ve thought of it. I have problems with my hands and feet being too cold all the time. I want to be able to do fun things outside in the winter time like building snowmen but I can’t because it’s too cold. Are there such thing as heated socks too? Yes there are heated socks but the better option is actually heated insoles. They are really comfortable and you can just leave them in your shoes or boots all the time. Just plug them in when you get hom eand they’ll be all charged up when you need them.